Investment companies are entities that issue securities and whose primary business is investing in securities. We have written about investment companies in several of our posts (See here and here). This post provides a quick introduction to investment companies and the securities they issue. The three main types of investment companies according to federal securities regulation are: closed-end funds, unit investment trusts, and open-end funds. Some of the main characteristics of investment companies refer to the timing and venue in which their securities are sold. While closed-end funds and unit investment trusts sell a fixed number of shares at their Initial Public Offering after which investors buy shares from the secondary market, open-end funds which are also commonly referred to as mutual funds sell shares daily. Other defining characteristics are the price after the securities’ initial public offering and the possibility of redemption from the issuer. While open-end funds and unit investment trusts trade and are redeemable at their Net Asset Value (NAV), closed-end funds may trade at a price that is different from NAV and are generally not redeemable. Investment companies differ in their management of their assets. While the portfolios of closed-end funds and open-end funds are actively managed by registered investment advisors, the portfolios of unit investment trusts are not actively managed and the securities are held until they mature or until each trust’s Termination Date. The different types of investment companies also have differing rules relating to permissible leverage. 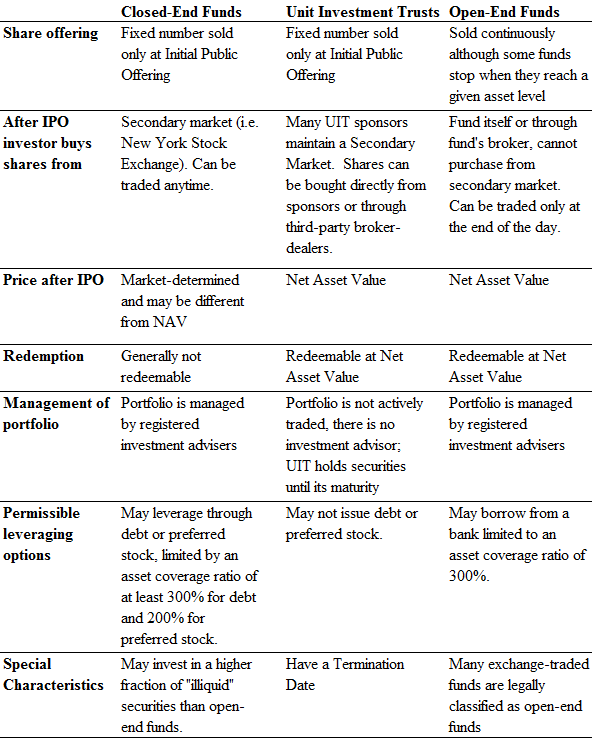 The table below summarizes the main characteristics of investment companies. Some investment companies are Exchange-Traded Funds (ETFs). ETFs are investment companies that are most often legally classified as open-end funds, although some may be classified as unit investment trusts. ETFs sell large blocks of shares (generally 25,000 to 200,000 shares) called “creation units,” which are typically purchased by large institutional investors, such as broker-dealers. 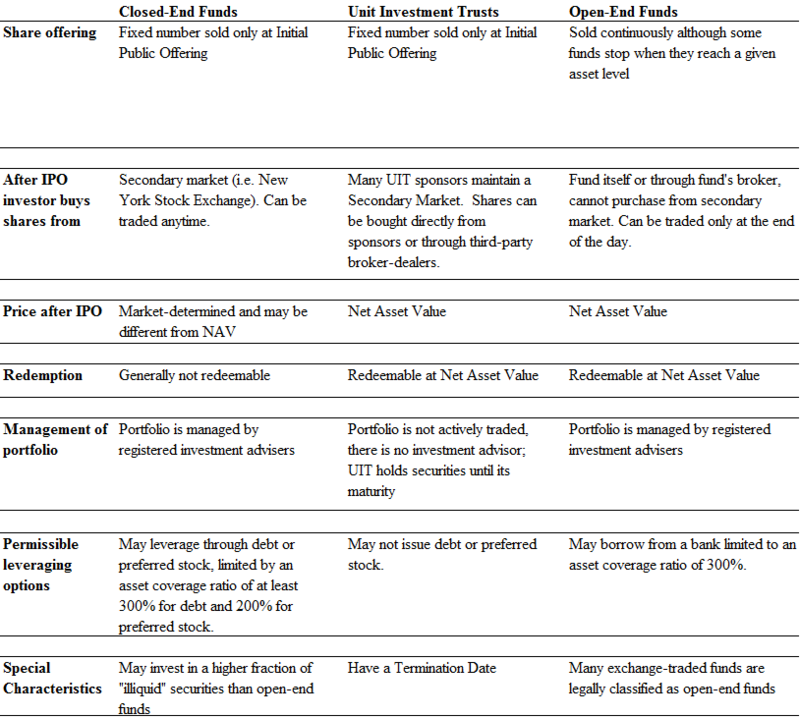 The “creation units” are typically purchased with a set of securities that mimic the ETF’s portfolio. Institutional investors, which are often called “authorized participants” may choose to hold the ETF shares or sell them on a stock exchange, allowing retail investors to obtain exposure to ETFs through their brokerage firms. Authorized participants may sell creation units back to the ETF in exchange for a representative sample of the securities in the ETFs portfolio. Retail investors wishing to dispose of their investment in an ETF may sell their shares in the secondary market at anytime throughout the day. (See here for more information on investment companies in general). By the end of 2010, investment companies held $13 trillion in total net assets according to the Investment Company FactBook (See more information here). 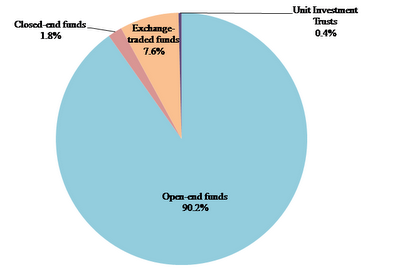 Over 90% of these funds were held by open-end funds.